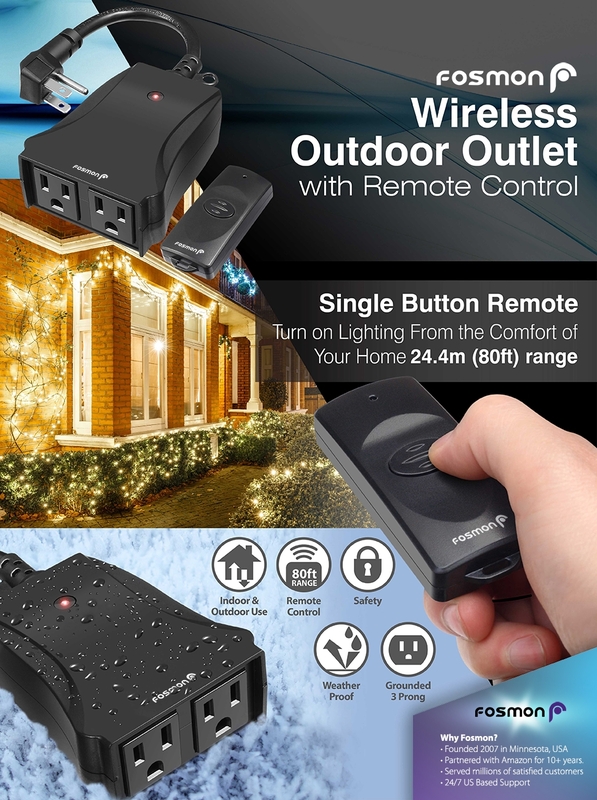 [WIRELESS REMOTE CONTROL OUTLET WITH TWO PLUG CAPACITY] Remotely turn your indoor and outdoor lighting ON/OFF anytime with Fosmon's wireless remote control outlet. It is ideal for seasonal lights and lamps. Conveniently turn your outside lights on from indoors or in your car with its 24 meter (80 foot) range. [WEATHER RESISTANT CONSTRUCTION] The wireless remote control outlet is durable and weather resistant, making it suitable for outdoor applications. Simultaneously operate 2 lighting elements with the grounded 3 prong AC plug. Its 6 inch (15cm) flexible cord safely and easily plugs in any standard grounded outlet. [ONE OUTLET, MULTIPLE USES] The remote control outlet works indoors and out. Great for TVs, lighting, heaters, sprinkler systems, terrariums, aquariums, humidifiers, and more. [ETL RATED AND FCC CERTIFIED] Fosmon's remote control outlet carries a max capacity 125VAC, 60HZ, 15A, and is ETL Listed and FCC certified, making it safe to use indoors and outside. Now you can control outlets and outdoor lighting remotely with the Fosmon wireless remote control outlet. Simultaneously control different lighting elements or fixtures by plugging them into one of the two grounded outlets. You will be able to operate any outlets from the comfort of your home with the remote control outlet's 80 foot (24.3 meter) range. The included remote control is compact and easy to store. The durable ABS construction, weather resistance casing, and 6 inch (15 centimeter) 14 AWG cord make the remote control outlet perfect to safely use outside in the worst of weather. The remote control outlet can be used for a host of devices and appliances. Safely plug in multiple 125V appliances, from TVs, lighting, heaters, sprinkler systems, terrariums, aquariums, to humidifiers and so much more. We have served millions of customers and every product comes with a limited lifetime warranty. Got a question? Reach out to our experienced and dedicated USA based customer support 24 hours a day, 7 days a week. Please refer to Fosmon's website for more information.